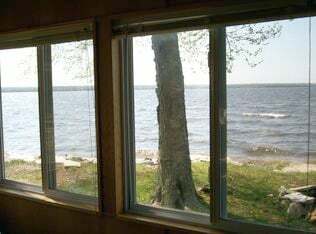 Indian Lake Cabin #1 at the Mountain Ash Association: Sleeps 4, new dock & gorgeous view! Consider this cabin an upgrade from camping. 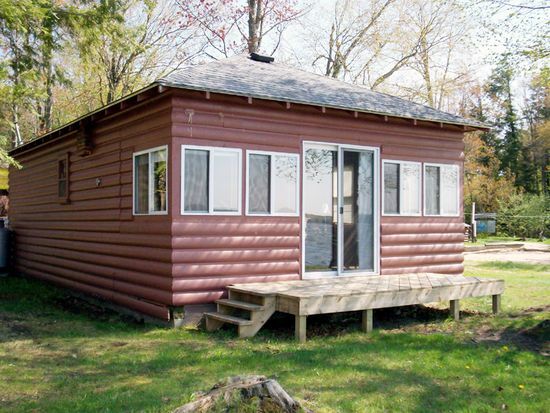 Along the shoreline of Indian Lake, this old-school (1940s) cabin is an ideal get-away for the small family or couple who used to like to camp, or wants a more rustic experience. Walking around the cabin, the ground is uneven in places. Please watch your steps. There are cottages within earshot, as this was once the Mountain Ash Resort, a historic spot for many years. 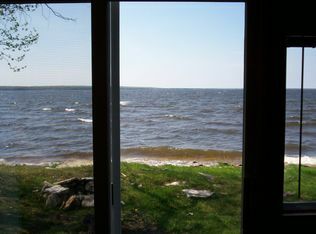 The shoreline is rocky, so it isn't easy (though not impossible) to hop into the water directly in front of the cabin. Due to the rocks, swim shoes are suggested. Swimming directly in front of the cabin is not ideal for small children. When you are at Indian Lake Cabin #1, feel like you are a part of the water at Indian Lake. We are located in Manistique, Michigan in the Upper Peninsula. Located along Indian Lake, which is 8,400 acre Spring fed lake. 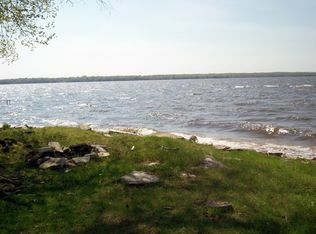 Indian Lake is the fourth largest inland lake in Michigan's Upper Peninsula with an area of 8,400 acres. It is 5 miles long and 3 miles wide. 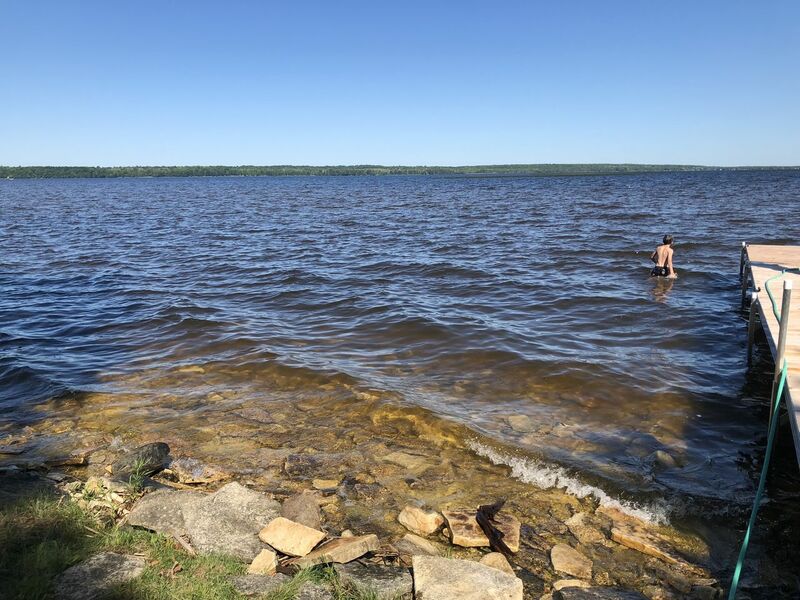 Indian Lake has a maximum depth of 18 feet with about 90 percent of the lake less than 15 feet deep. Game fish include perch, walleye, northern pike, muskellunge, rock bass, small mouth bass, bluegill, sturgeon and brown trout. It is rocky along the shoreline, except in a tiny, sandy area. The lake has a sandy bottom, yet you have to walk through the rocks in order to hit the sand. This area is great for swimming, hiking, golfing, biking, fishing, hunting and sight seeing. Spend the day boating, read a book on the deck under the umbrella, or enjoying the tiny sandy beach area. Then, spend the evening having a tasty barbecue and a soothing bonfire. You are literally steps (10 or so) from the lake. Gorgeous, wide open view of the water. Enjoy being outside in the fresh air! This cabin provides a kitchen with dishes, cooking utensils, microwave, toaster, coffee pot, fridge and a gas stove. Artesian well water. Feel free to enjoy time under the community pavilion with the newly paved sitting area, and sandy bottom swimming. Indian Lake Golf Course: A very popular, 18 hole golf course along Indian Lake. Just 5 miles from the Cabin. The Kewadin Casino: It is approximately 10 minutes (7 miles) from the Lodge. Historic Manistique Water Tower : The Old Water Tower is one of the many historic sites in Schoolcraft County. Built in 1923 and constructed in the “Roman revival” style, it is also listed in the national register. The renovated building will provide space for arts related public events and public rest room facilities while preserving one of Manistique's unique and historic buildings. Fayette State Park & Historic Townsite: Fayette was once one of the Upper Peninsula's most productive iron-smelting operations. Located on the Garden Peninsula at Snail Shell Harbor. When the charcoal iron market began to decline, the Jackson Iron Company closed its Fayette smelting operation in 1891. It is now a completely restored village including 22 historic buildings, museum exhibits and the visitor center, which can be toured May through October. The historic site is located in Fayette State Park. You can paddle to Indian Lake in about 2 minutes, it's just across the street and the headway is just a couple hundred yards away. Cell phone service: Cell phone service is generally unreliable in the Upper Peninsula when you travel outside of Marquette and Escanaba. 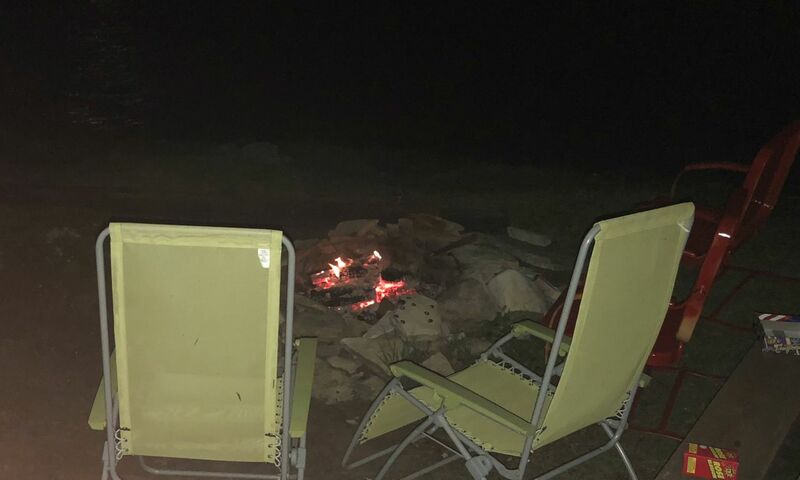 Firepit & Firewood: There is a portable fire pit on wheels. We do not guarantee there will be firewood available during your stay. Many times, you will find firewood left in close proximity to the cottage, that you are welcome to use. Firewood Rick at (906) 341-5698. He's just down the road and generally can deliver a face chord of wood for approximately $60 - delivered. Grill: There is a charcoal grill provided for your use. Guns: We can not allow target shooting anywhere near the Indian Lake (Mountain Ash Association) Cottages. There are neighbors close by. Plus, there are local 2 gun ranges in the area that are accessible. Play area/ Swing set: There is a small children's play area with a swing-set and plenty of room for outdoor children's games across from the community grilling area. Towels: Yes, we have both basic towels and linens for your stay. Swimming: The sandy swimming beach area right next to the cabin, with a convenient pavilion and community grilling area. Water (well):Our water has passed all the county water tests. You are welcome to use the water as you would at home. Your hospitality and accommodations were wonderful -- as well as, your quick response to our request re the gas heater. Thanks so much for providing the space for a wonderful vacation. Mary Ellen, thank you for the kudos for FVR! We really appreciate your comments. We are so happy that you enjoyed your stay at Indian Lake Cabin #1, and we hope that you come back again. I enjoyed my stay at Indian Lake, the view of the lake was very beautiful. Fishing was not good. weather was great! A great place for family reunion. Cabin was clean, plenty of dishes , cookware. Beds were comfortable. Would make this this trip again . We used the grill and fire ring every day. At night it was very quite, overslept each day!! Tim , it sounds like you had the perfect vacation (except for the fishing)! Sleeping in because it is so quiet is such a treat. We do hope you come back again. We really enjoyed our stay. The amenities were better than expected and there is a lot to do and explore within a fairly short distance. Joshua, we are so happy that Indian Lake Cabin #1 was even more than you expected. The U.P. offers so many wonderful places to explore, so it's great to have a good home base like this cabin. We stayed in Cabin #1, and enjoyed every moment of it! 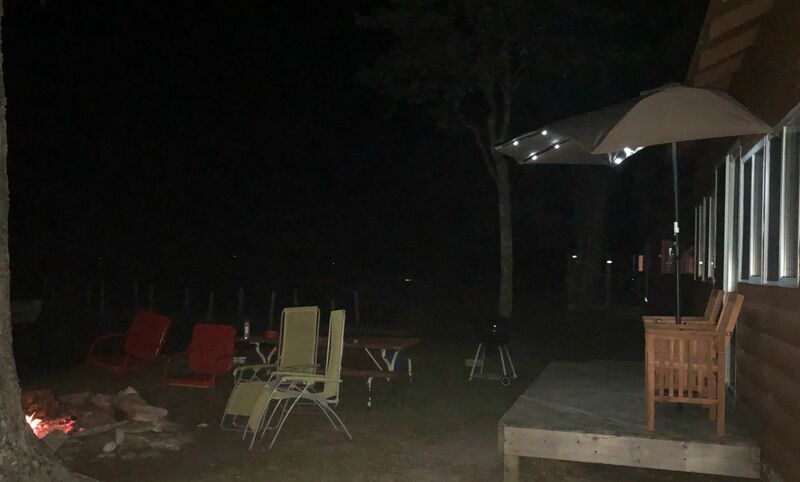 It has a beautiful view of Indian lake, a fire place and a grill. Good sized living room and kitchen. It was stocked with a few board games, too ! It was so cozy, and really felt like home by the end of our trip. I was so sad to leave. Kori, it makes our day to have our guests sad to leave Indian Lake Cabin #1. We hope to see you again! This cabin was great for what we were looking for. Great price, all the amenities you could need plus some and a great location that allows you to get around to the best of what the UP has to offer within a fairly short time. I highly recommend this property if you are looking for an affordable place to stay while adventuring about. Josh, thank you for appreciating Indian Lake Cabin #1 as much as we do. This old-school (1940s) cabin is an ideal get-away for the small family or couple who used to like to camp, or wants a more rustic experience, and it does give you proximity to the wonders of the U.P. We hope to see you back again. Had a great time. Everything was as advertised. Will use your service again.FRESHWATER RESPONSE:David, we love hearing that our guests want to use FVR again! We make every attempt to be straightforward in the advertising of our properties. We will look for your return. 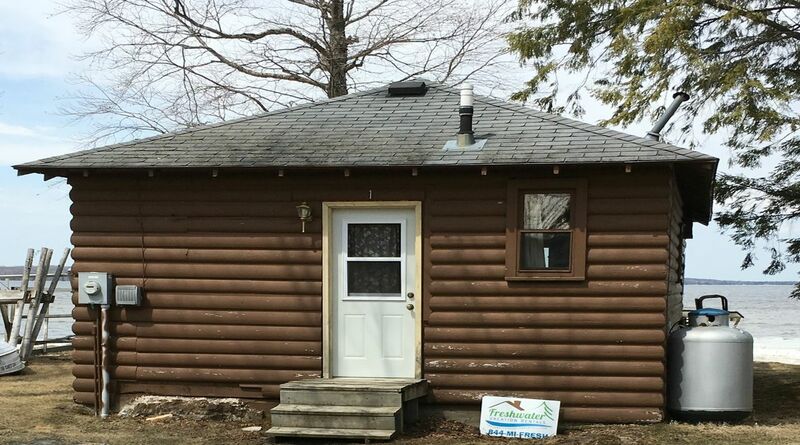 Very clean, great location on a lake and close to a city and many parks... I recommend it. Mandy, we are so glad that Indian Lake Cabin #1 was a good spot for you. Spring fed lakes such as Indian Lake are so great to swim in. Thanks for the recommendation ! cationThank you so very much for the great service! Working with all of you in such a positive manner made our stay at Indian Lake much more enjoyable. Hope to work with you all again soon. Randy thank you for your kind words. We at Freshwater Vacation Rentals make every effort to give our guests the very best service possible. 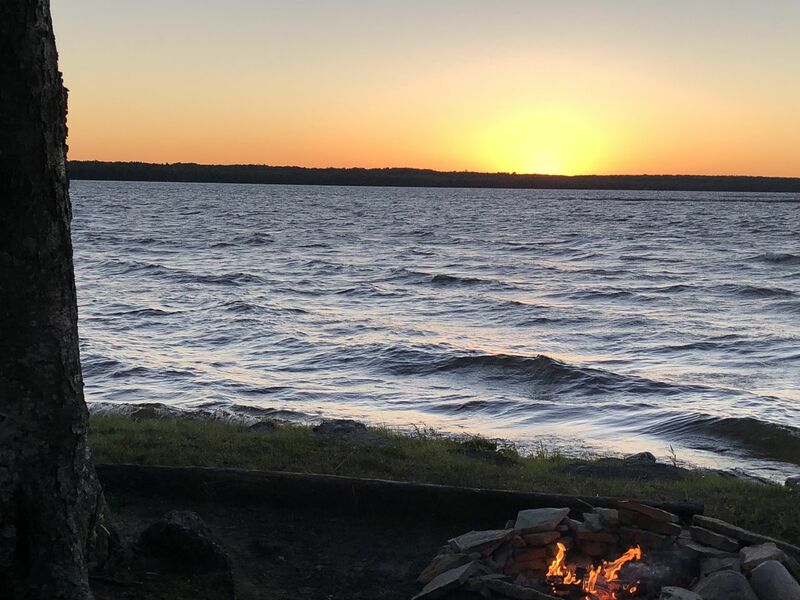 We're so happy that you enjoyed your stay at Indian Lake Cabin #1. It's such a cute cabin! We look forward to working with you again in the future. The cabin was quaint & we didn't hurt for any kitchen utensils or amenities. Very clean.